Today’s article is more or less a “release” of thoughts, experience, and emotion connected to the game of hockey in an unedited, unfiltered way. In a very real sense, I am sitting down at 10PM and releasing what I feel is fundamentally important for every hockey player on this planet to read. The body always follows the mind, it doesn’t work the other way around. We see this so often in those who seem like such prospects at a young age, and yet by the time they are mature and able enough to make their own decisions they never get far in this game and end up saying things like “what if” in their late 20’s. Their body had all the tools, yet it was their mind that held them back from making it. You will come across a lot of people who will point towards things such as motivation and discipline, and claim that these are the real keys to success. Although they are a single key, I wouldn’t ever call them “the” key to success. In a very well and upfront way, if you don’t master your self-talk you will never master your on-ice performance. We always talk to ourselves in our heads, we don’t really just “think thoughts”. High-achievers in hockey don’t just let their brains go on default-mode, that’s the fastest route to mediocrity. Instead, the best hockey players harness the power of self-talk, whether consciously or unconsciously the quality of their mindset always determines the quality of their behavior. How you direct your own self-talk comes directly from the quality of mindset you have to begin with. That quote has always struck hard with me since the first time I heard it almost ten years ago now. The highest achievers in this world utilize a positive self-supporting talk as an ally in their pursuit. Non-achievers, on the other hand, are the average people you see around you who are set on auto-pilot year round. They do “just enough” for everything in life and completely lack the self-awareness that they need for the “real talk” that they need to have with themselves. As Henry Ford alluded to, everything you tell yourself is extremely powerful. Most people will say that they already know this, but so few consistently act on it on a regular enough basis in order to program their mind for hockey success. You have complete control over the messages that you send yourself. This means that you have both the ability and the capacity to harness the power of your own thoughts in every facet of your life, and therefore have the tools readily available to you in order to improve your hockey performance from every angle possible. Are you doing this already? When you look into psychology data, you quickly find out that people are much quicker to jump on negative thoughts and experiences to guide their decision making rather than self-supporting and self-compassionate talk. I’m sure you can relate to this, if the burner is hot you learn never to touch it again. Negative consequence = New lesson learned. The problem that happens in modern day society is that hockey players are stuck on auto-pilot mode, so all they do is jump to negative thoughts and conclusions in order to make their decisions. This is the death of your hockey potential. Until you start getting real with yourself and learn how to exercise your own self-awareness to become stronger from the inside-out rather than the outside-in you will never win the long game. The best hockey players are inside-out directed, meaning, they are self-directed people. They listen to their voice and not anyone else’s. This process allows them to quiet the noise of the opinions around them, disregard what circumstances are currently facing them, and ignore the negative people in their circle who don’t believe in them. What’s the script look like in your self-talk conversations? When your self-talk is structured by anger and criticism, this will inevitably lead to self-sabotage in order to avoid the continued discomfort of being in the position that you’re currently in. No athlete has ever self-rejected their way to success, confidence and performance just don’t work like that. You need to have the self-awareness to be able to recognize when your self-talk is serving you or not. Since our self-talk has the ability to alter our emotional state, we need to use it in a way that neutralizes the emotions that don’t serve us in both the short and long run. Short run in reference to the nerves that might lead up to an important game, and long run describing how happy and fulfilling your time in this sport will be. It isn’t about just avoidance though, because “avoiding” isn’t necessary when you focus on what serves you. Our self-talk directed towards the emotions that serve us will naturally fend off the ones that don’t. Self-talk might be hard for some of you to conceptualize if this is a new concept to you, so I want to go through a few examples of how you should think, and how you shouldn’t think. “I can do this, I WILL do this” is self-talk that leads to emotions of anticipation and motivation. “I have had worse games than that, we’ll bounce back” is self-talk that is relaxed, confident, and will prepare so that lackluster performance won’t happen again. But at the same time not self-loathing. “Circumstance doesn’t change the standard” is self-talk that is determined, self-supporting, and positive regardless if those around you may have been given an easier road than you. “I have to do everything perfect!” is self-talk that breeds anxiety, nervousness, and pressure. “I hope I don’t do that again!” is self-talk that reminisces about the past which brings fear, doubt, avoidance, and worry. “Whenever I start doing well I screw it all up” is self-talk that feeds hopelessness, apathy, and self-defeat. As deep as you can dive into all of the logistics surrounding self-talk and the emotional outcomes and how that can end up ruining your hockey performance… the first step is still quite simple. Start taking personal responsibility for what you tell yourself. You are the only one who is responsible for the thoughts that you pay the most attention to. Are you thinking self-supportive or self-defeating thoughts? People change, and so can you. It all begins with the dialogue that you decide to play in your mind. Just like you change the channel on your TV because you don’t like what is on, you can change the channel of your thoughts to deliberately generate constructive self-talk that leads towards the things you want in this life. The beauty of this when you practice it regularly is that it feeds itself. Positive self-talk leads to positive emotional reinforcement which in turn leads to more positive self-talk. This is a positive feedback loop where your self-talk, your emotions, and your thoughts all keep nurturing each other in a healthy and productive way that is conducive to maximizing your hockey performance. Negative self-talk will lead to negative emotional reinforcement which in turn leads to a negative feedback loop that you can’t get out of. It’s like digging a ditch of low-confidence that seems impossible to get out of. But you have to change, and you have to change today. It’s nearly impossible achieving anything with a negative mindset because it dominates your intellectual and emotional agenda. Because of this, constructive self-talk is always the first step that matters the most. This is what so many coaches and motivational speakers completely miss. Constructive self-talk leads to improved discipline and behavior, and that improved discipline and behavior leads to better results, and those better results lead to more motivation in order to repeat the cycle over and over again. But the cycle of discipline and motivation never begins until you are able to talk yourself into becoming the person that is able to start that process. A hockey player can’t just “be disciplined” until they have the confidence, assurance, and emotional readiness in order to do so. From that point, it’s a positive feedback loop that leads to progressively greater performance. It’s all good and well to say these things, but I titled the sub-heading of this paragraph for a reason, you have to start taking personal responsibility for this. Even though there is a lot of natural emotional presence in self-talk, you still need to bring your logic to the table and devise a plan that makes this thing happen no matter what. Your hockey performance depends on it. When you become fully aware of the personal responsibility you have to take about how you think and how that impacts your reactions and responses to life’s circumstances, then you can be more “intentional” about engaging in self-supportive patterns from this day forward. Anyone on this planet can be positive for a day, week, or even a month. It takes much more to ingrain these positive patterns in you until they become your new autopilot setting. Catching yourself when you’re being negative, anxious, or unsupportive is for most people the first step towards turning things around. Consistent practice and habituation of intentional self-supportive talk is what matters. If you think that it “doesn’t come naturally” to you, I don’t care. You can still do it, and if you think that, it means you HAVE to do it more than anyone else. Just change the channel. Hit that button, no matter how hard it is. These are the thoughts and rants of a coach who has been in the game for a long time and is laying it all out on the table. You have to start thinking about your mind just like you do your muscles. Just like your muscles, it has to be worked and trained consistently in order for it to become “more fit for the task”. Learning self-supportive talk may seem weird and difficult at first, but so were Bulgarian split squats. But with enough repetition, you got good at them, got more confident performing them, and became stronger doing them. Looking back, the price of not doing Bulgarian split squats was worse than actually doing them. The strength and hockey performance enhancement you gained was worth it ten times out of ten. The exact same ideology works for your mind with respect to self-talk. The price of not engaging yourself in this way is more costly than avoiding it. Your self-talk has a direct impact on your mental performance and your mental performance has a direct impact on your physical performance. This type of talk isn’t just a “tool” for hockey performance, it is a must. 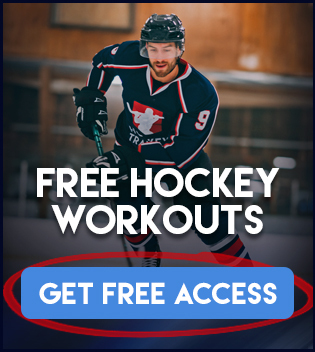 If you’re ready to turn your hockey mindset and hockey performance around by adding more hockey specific programs to your toolbox, make sure you check out the Hockey VIP Program today. Hi Coach Dan, I was on your live Q&A session on Instagram. @yasminuurya. I have to be honest though I was scrolling through a bunch of stories and I popped in your live session accidentally. I was also just drying out my gears from practice. I’ve been looking for someone to tell me something about self-talk in hockey. I think naturally I do it all the time and especially when I know I’ll have a game coming up. I just wasn’t sure what kind of talk I should have with myself and you just made it way more clearer here. Also before I joined your live session my team had a test match and ironically the whole week leading up to that moment I wasn’t thinking about my competition at all (partly because its just a test match but I also knew how well the competiton plays). Usually before an important game I’d get so nervous I end up having a stomach ache. Sometimes while in my gear right before the last second to go on ice. But my point is, it’s good to know that the self-talk I’ve been having with myself is not a pointless exercise. Although I still feel I struggle with making more positive ones than negative, I know how to apply it now. But my last question, how far away before game day should I prep my mind? Really glad you tuned into the IG live! Those are always fun. Regarding your pre-game nerves, you should listen to episode #9 of the Hockey Training podcast called “Dealing With Pressure In Hockey” — I really dig into pre-game nerves there and offer some insight/tools you can use to help you. Now regarding your question — it’s not so much how long one should prep their mind before a game as much as it is who you are inside and outside of the arena. An excellence mindset is something you have, not something you turn on. For now, mental preparation for a game can be done on game days only because everyone needs a little practice in the beginning — but for the future I would love for you not to DO the part, but BE the part.